Copyright: © 2017 Triantafyllis V, et al. This is an open access article distributed under the Creative Commons Attribution License, which permits unrestricted use, distribution, and reproduction in any medium, provided the original work is properly cited. Most patients with anterolateral ankle pain report some history of trauma as the precipitating event. In the majority of cases of anterolateral ankle pain with no history of trauma the cause is proliferative synovitis, especially in the area of the anteroinferior tibiofibular ligament [1,2]. 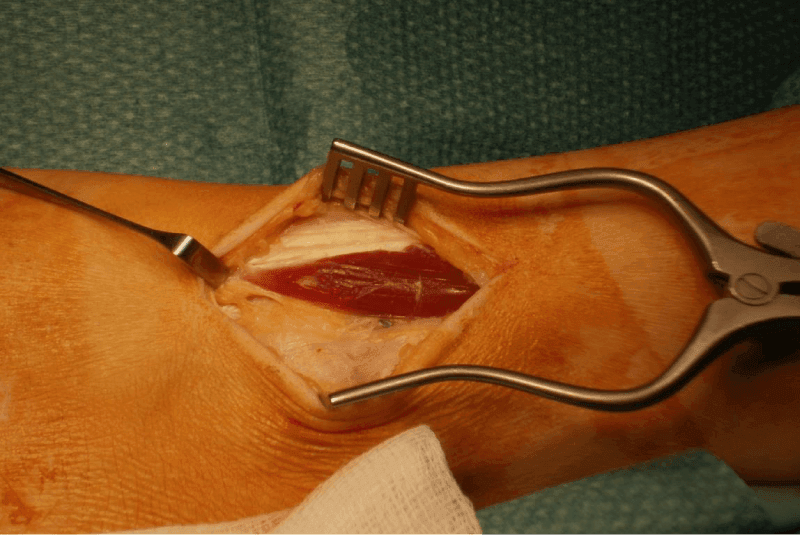 Our case report is about a patient with anterolateral ankle pain and snapping, with no history of trauma, caused by an abnormal peroneal tertius muscle belly. We have found only one similar case reported in the literature . That particular case was treated with arthroscopic resection, which requires specialist arthroscopic skills. In our case we have done an open resection, which can be safely performed by most surgeons. A 26-year old woman was referred to our outpatient department with a complaint of left ankle pain and snapping. She reported that her symptoms started with snapping approximately two years before and had progressed to pain and limping, especially after physical activity. Her symptoms affected the anterolateral part of her ankle and there was no history of trauma. She was initially treated conservatively with physiotherapy, strapping, activity modification and anti-inflammatory medication. She was referred to us when conservative measures failed to improve her symptoms. On examination, her left lower limb had normal alignment. The patient’s gait was normal as well. There was a soft palpable mass over the anterolateral aspect of her ankle, measuring approximately 2x3 cm. The mass was non-tender, non-pulsatile and did not seem to adhere to any other structures. The mass appeared to be extraarticular to the ankle joint. Percussion over the mass did not produce any symptoms. Her left lower limb was neurovascularly intact, with good distal pulses and normal sensation. Range of motion and muscle strength were assessed clinically and they were normal. There was no ankle instability and no sign of peroneal tendon dislocation or subluxation. Snapping could be reproduced with dorsiflexion of the ankle, at which point the mass seemed to snap over the anterolateral aspect of the ankle. Radiographs of the ankle on the AP and lateral views were normal. Bearing in mind that the only diagnosis compatible with the clinical examination was either a ganglion cyst or a soft tissue mass, no further imaging was performed and surgical excision was offered to the patient. The patient decided to proceed with surgical treatment because of the longstanding symptoms, the failure of conservative measures and the presence of the mass. The left ankle was examined under anaesthesia and no instability was demonstrated. Snapping could be reproduced with ankle dorsiflexion, especially with foot inversion. 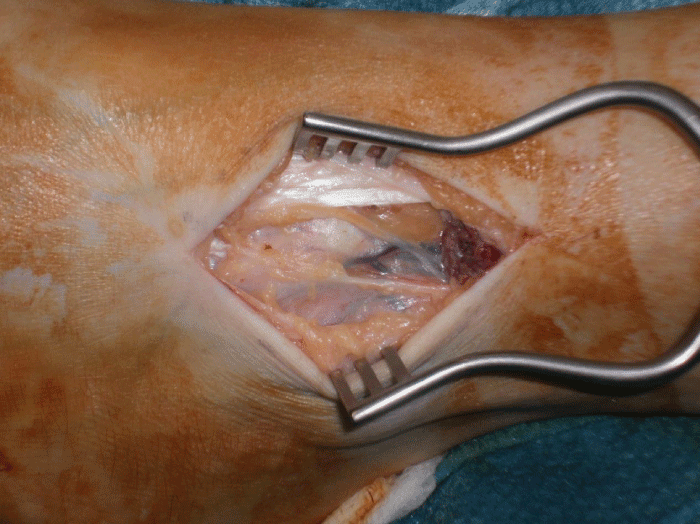 The mass was approached through a longitudinal skin incision over the anterolateral aspect of the ankle. The swelling proved to be an abnormal extension of the peroneus tertius muscle belly distal to the level of the inferior extensor retinaculum (Figure 1). Figure 1: Abnormal peroneus tertius muscle belly. Motion of the ankle reproduced a visible snapping of the muscle over the anterolateral talardome (Figure 2). Figure 2: Peroneus tertius muscle belly retracted. Forceps pointing to the anterolateral talar dome. The segment of the distal peroneus tertius muscle snapping over the lateral talardome was resected. No snapping was observed post-resection (Figure 3). Figure 3: Resection of the peroneus tertius muscle belly. A compressive bandage was applied to the patient’s left ankle for two days and she was encouraged to weight bear as able. She was also given a programme of range of motion and strengthening exercises. Her progress was monitored by our physiotherapy department. Two weeks after the operation all symptoms had disappeared, except for a dull ache over the operation site. At six weeks she was symptom free with a full range of ankle motion. She had resumed all her routine activities and her ankle dorsiflexors and evertors had good strength. The patient attended our outpatient department three years later for an unrelated problem and she reported no recurrence of her snapping or pain at the operated site. Snapping from an abnormal distal muscle belly of the peroneus tertius muscle is a rare cause of atraumatic anterolateral ankle pain. In our review of the literature only one similar case has been reported, which was treated with arthroscopic resection of the muscle belly . The muscle belly of peroneus tertius normally ends proximally to the inferior extensor retinaculum . Anatomic variations of the peroneus tertius muscle can occur, but they usually affect the muscle’s insertion with an accessory slip to the base of the 4th metatarsal . The peroneus tertius tendon can impinge on the cuboidometatarsal joint, which can occasionally be painful . The peroneal tendons typically cause posterolateral ankle pain and snapping, when they dislocate over the lateral malleolus. In this case there is usually a history of trauma with disruption of the retinaculum [7,8]. A common cause for anterolateral pain and snapping is synovial impingement in the anterolateral gutter, especially in the presence of anteroinferior tibiofibular ligament hypertrophy [9-11]. In such cases, arthroscopic intervention would be the treatment of choice. However, when the cause is obviously extraarticular, as it was in our case, open surgery may be a better option. 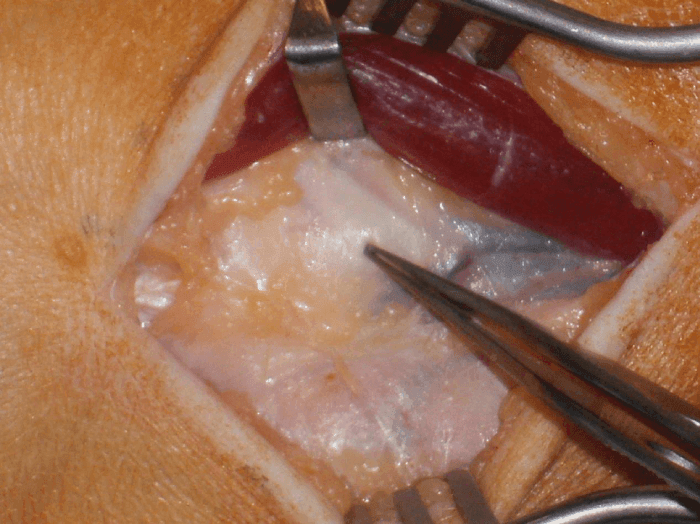 Open surgery enables a simple resection of the abnormal distal peroneus tertius muscle belly. The extend of the resection can be determined intraoperatively by the elimination of the snapping. The partial muscle resection can be performed safely without the need for specialist arthroscopic skills, as it is performed under direct vision. Sarrafian SK. Anatomy of the Foot and Ankle. 2nd ed. Philadelphia, PA: Lippincott-Williams & Wilkins. 1993.